20.09.2017 – True to EMO 2017’s theme ‘Networked systems for intelligent production’, CAM/CAD manufacturer OPEN MIND is debuting hyperMILL® VIRTUAL Machining, a key component for implementing digital production systems. The simulation solution creates a perfect virtual rendering of reality in the machine based on NC data. Built with Industry 4.0 in mind, the tool generates a bi-directional communication link between the machine control and the hyperMILL® VIRTUAL Machining Center, thus delivering a new level of process control and optimisation. Components are becoming more and more complex, yet turnover times keep getting consistently shorter. As a result, manufacturing companies must optimise the productive time of their machines by minimising auxiliary processing times and preventing production downtime. The highly efficient NC code-based hyperMILL® VIRTUAL Machining simulation solution from OPEN MIND enables manufacturers to do just that. Thanks to added networking and virtual mapping of the actual processes, machining operations can be reliably evaluated, checked and optimised before running the job. 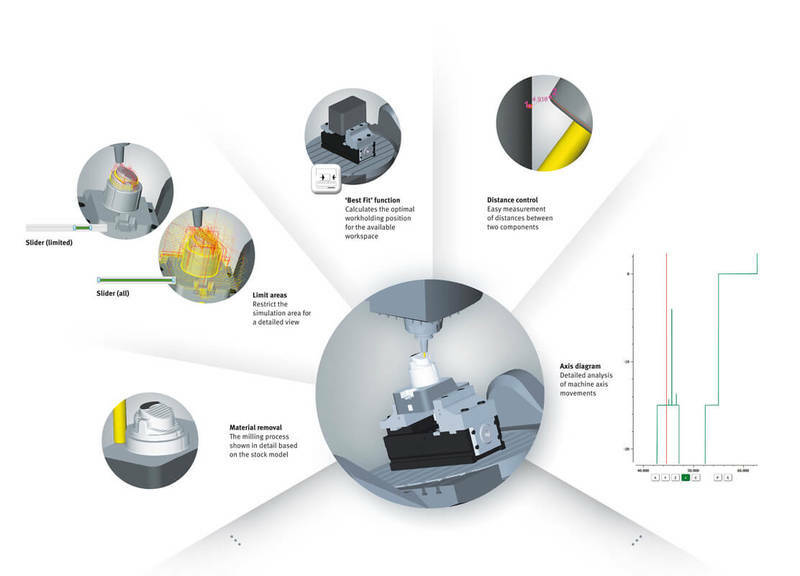 The Center, Optimizer and CONNECTED Machining modules of the simulation solution help to decisively step up communication between the hyperMILL® CAM suite and the machine tools. The core solution, the hyperMILL® VIRTUAL Machining Center, draws on cutting-edge postprocessors from OPEN MIND. It offers a rich selection of simulation and analysis options based on the NC code following the postprocessor run. The optional Optimizer module offers functions such as automatically choosing the best setting from the wide range of possible tool angles for multi-axis processing. The CONNECTED Machining component implements a bi-directional communication path between the machine tool and the CAM workstation, thus allowing for an interactive dialogue between the program that is being created and the machine. Machine simulation is carried out with a defined machine model, taking into account the workpiece and tool as well as the tool holder, fixtures and clamps. Axes can be moved manually in the simulation, axis limitations are indicated and limit switch traversals are detected automatically. Individual processing steps can be simulated separately or used as a starting point for the simulation. The simulation checks each movement before the machine lead-in, which means that the hyperMILL® VIRTUAL Machining Center delivers maximum processing safety. 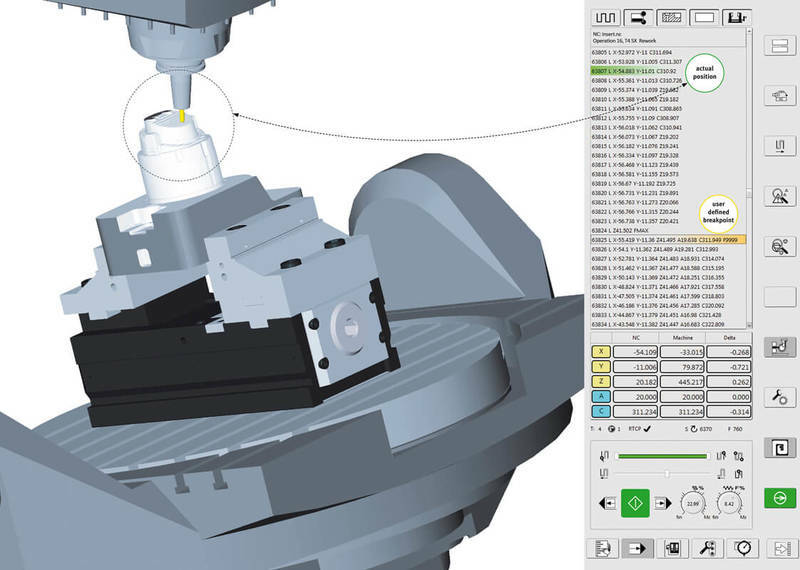 The hyperMILL® VIRTUAL Machining Optimizer module brings simplicity to multi-axis machining. Thanks to powerful optimisation algorithms, the Optimizer automatically determines the best tool position that allows efficient traverse movements during machining. All selected tool positions are checked for possible collisions, thus assure a safe machine run. The Optimizer helps to avoid programming errors, which also does away with the need for making subsequent changes to the machining programs at the machine. hyperMILL® CONNECTED Machining enables networking and synchronisation with the machine. The deep link created by the module provides a means for bi-directional data exchange with the control. This means that users can send data to the machine and execute it there, as well as receive data from the machine. Therefore, the simulation provides actual machining data in real time. This way, the CAM system and machine world are networked in the best possible way. Before starting the machine, a safety protocol is executed to compare various machining and machine configurations. This includes reading out zero-point definitions, tool data and machine configuration parameters and checking these against the program data in hyperMILL®. The actual machining job will only start if these data sets match and if the collision check did not come up with any issues. As an additional safety feature, the NC programs are loaded directly into the memory of the control system, making it impossible to mix up the programs or access data without authorisation. The intuitive interface of the hyperMILL® VIRTUAL Machining Center is designed to deliver exceptional usability. CAM programmers, machine operators and manufacturing planners will master the new simulation technology very quickly, thanks to a user interface that has the look and feel of a real and familiar machine control system. The hyperMILL® CONNECTED Machining module seamlessly integrates with the user interface. A single click of the mouse establishes a connection with the machine. Moreover, the integrated remote control feature makes it possible to configure machining parameters via a laptop. 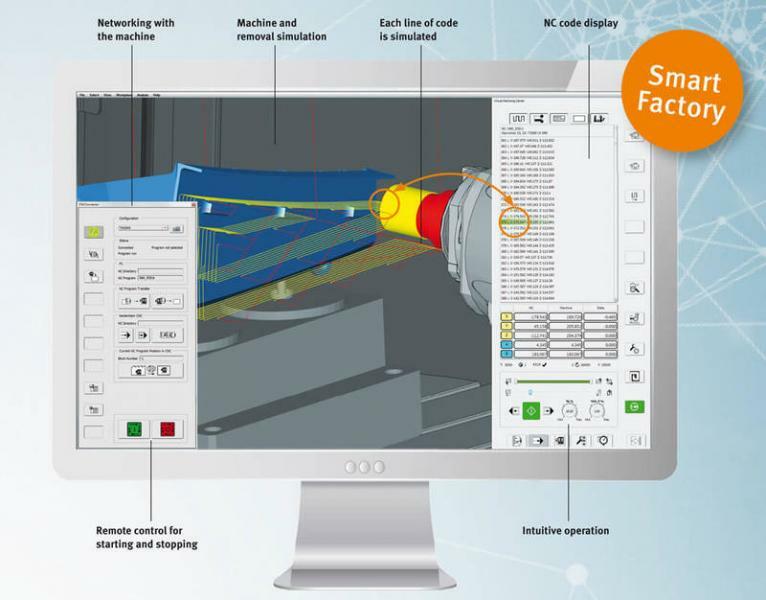 Given all these functions, the new hyperMILL® VIRTUAL Machining simulation solution represents a major step forward toward digitalised production as envisioned by Industry 4.0.